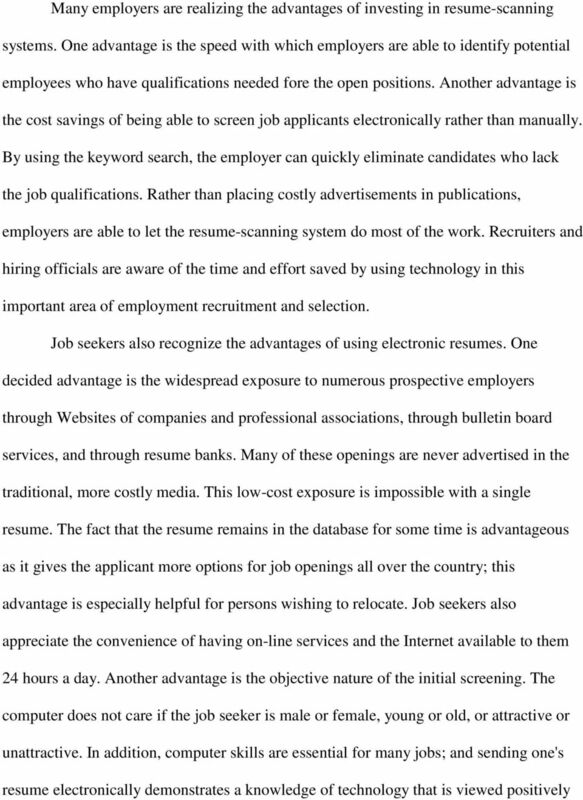 Download "USING ELECTRONIC RESUMES IN THE JOB SEARCH By Dr. Lillian H. Chaney and Dr. Catherine G. Green"
3 by many employers. Some job seekers also prefer sending their resumes electronically because of the costs associated with printing and mailing resumes. 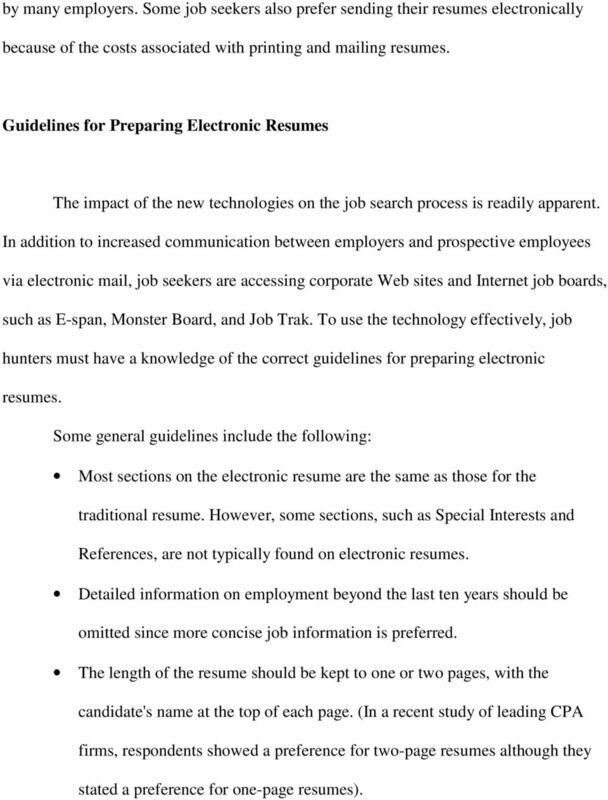 Guidelines for Preparing Electronic Resumes The impact of the new technologies on the job search process is readily apparent. In addition to increased communication between employers and prospective employees via electronic mail, job seekers are accessing corporate Web sites and Internet job boards, such as E-span, Monster Board, and Job Trak. To use the technology effectively, job hunters must have a knowledge of the correct guidelines for preparing electronic resumes. Some general guidelines include the following: Most sections on the electronic resume are the same as those for the traditional resume. However, some sections, such as Special Interests and References, are not typically found on electronic resumes. Detailed information on employment beyond the last ten years should be omitted since more concise job information is preferred. The length of the resume should be kept to one or two pages, with the candidate's name at the top of each page. (In a recent study of leading CPA firms, respondents showed a preference for two-page resumes although they stated a preference for one-page resumes). 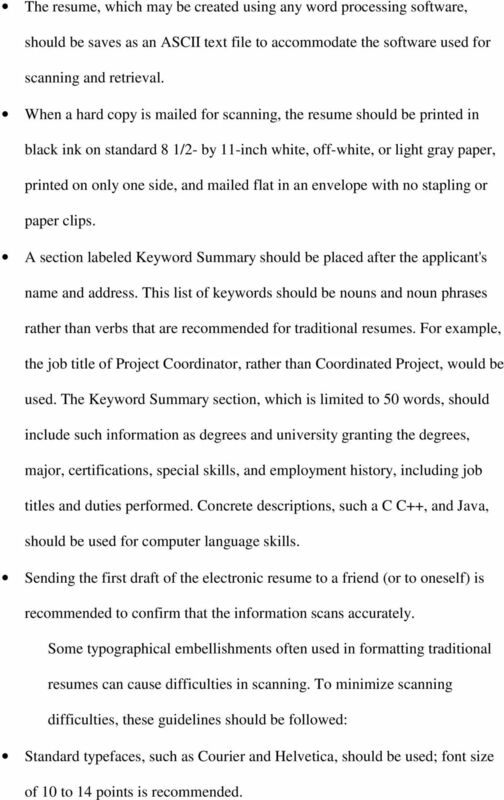 4 The resume, which may be created using any word processing software, should be saves as an ASCII text file to accommodate the software used for scanning and retrieval. When a hard copy is mailed for scanning, the resume should be printed in black ink on standard 8 1/2- by 11-inch white, off-white, or light gray paper, printed on only one side, and mailed flat in an envelope with no stapling or paper clips. A section labeled Keyword Summary should be placed after the applicant's name and address. This list of keywords should be nouns and noun phrases rather than verbs that are recommended for traditional resumes. For example, the job title of Project Coordinator, rather than Coordinated Project, would be used. The Keyword Summary section, which is limited to 50 words, should include such information as degrees and university granting the degrees, major, certifications, special skills, and employment history, including job titles and duties performed. Concrete descriptions, such a C C++, and Java, should be used for computer language skills. Sending the first draft of the electronic resume to a friend (or to oneself) is recommended to confirm that the information scans accurately. 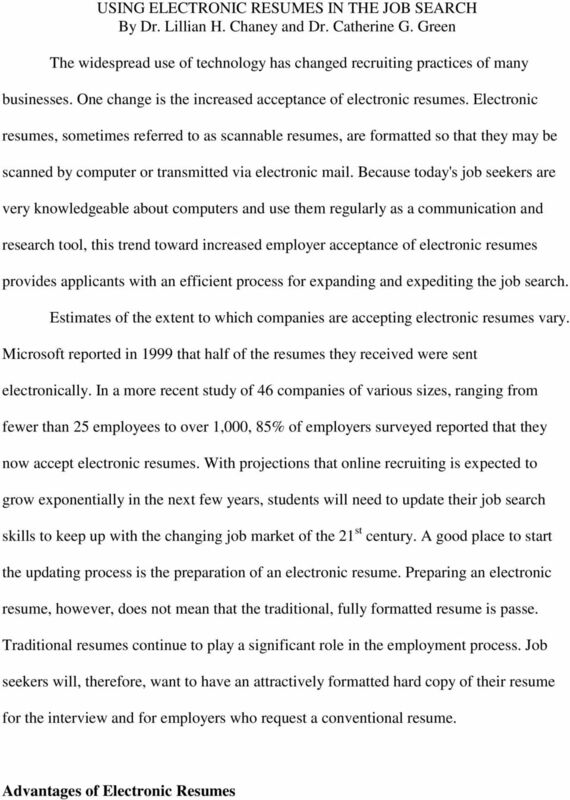 Some typographical embellishments often used in formatting traditional resumes can cause difficulties in scanning. 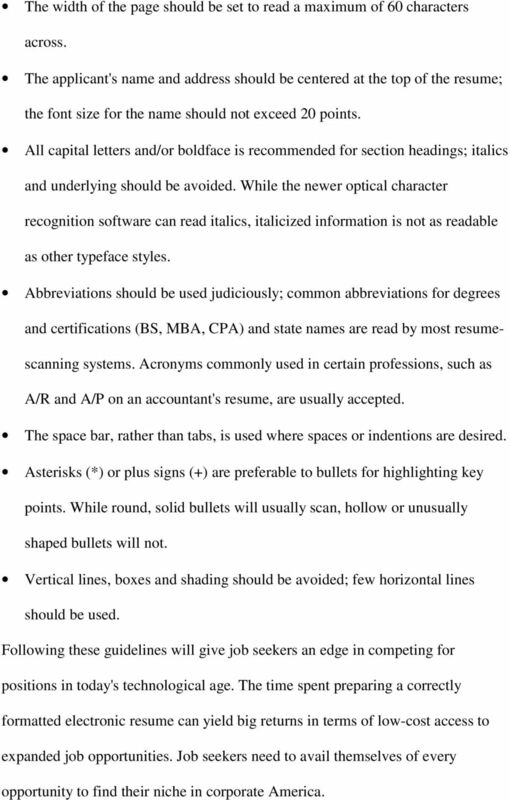 To minimize scanning difficulties, these guidelines should be followed: Standard typefaces, such as Courier and Helvetica, should be used; font size of 10 to 14 points is recommended. 5 The width of the page should be set to read a maximum of 60 characters across. The applicant's name and address should be centered at the top of the resume; the font size for the name should not exceed 20 points. All capital letters and/or boldface is recommended for section headings; italics and underlying should be avoided. While the newer optical character recognition software can read italics, italicized information is not as readable as other typeface styles. Abbreviations should be used judiciously; common abbreviations for degrees and certifications (BS, MBA, CPA) and state names are read by most resumescanning systems. Acronyms commonly used in certain professions, such as A/R and A/P on an accountant's resume, are usually accepted. The space bar, rather than tabs, is used where spaces or indentions are desired. Asterisks (*) or plus signs (+) are preferable to bullets for highlighting key points. While round, solid bullets will usually scan, hollow or unusually shaped bullets will not. Vertical lines, boxes and shading should be avoided; few horizontal lines should be used. Following these guidelines will give job seekers an edge in competing for positions in today's technological age. The time spent preparing a correctly formatted electronic resume can yield big returns in terms of low-cost access to expanded job opportunities. Job seekers need to avail themselves of every opportunity to find their niche in corporate America. 6 By Dr. Lillian H. Chaney and Dr. Catherine G. Green. Dr. Chaney is a distinguished professor of office management and professor of management. Dr. Green is an instructor of management. They both teach business communication courses at the Fogelman College of Business and Economics at The University of Memphis. JOB POSTING & RESUME SEARCH INSTRUCTIONS www.allretailjobs.com The Largest Career and Recruiting Board for the Retail Profession To follow are instructions on how to post a job and search resumes on AllRetailJobs.com. Or log on to your account via the Employers / Recruiters button located on the right side of the screen. The Psychology Lab Checklist By: Danielle Sclafani 08 and Stephanie Anglin 10; Updated by: Rebecca Behrens 11 1. Title Page My title is informative, mentioning both the independent and dependent variable(s). It s Time for a Job Description Makeover. A Whitepaper from Experience, Inc.